You can add photos to your website via the paragraph module on the page. Login to the CMS. Navigate to the paragraph where you want the photo or add a new paragraph. Click to edit the paragraph in the Edit Paragraph box. To add photos to a paragraph you should choose the “Photo” tab beneath the text box. Click the “Change” link or the box for the photo. Find the photo you would like to use and click on it. This will automatically insert it. 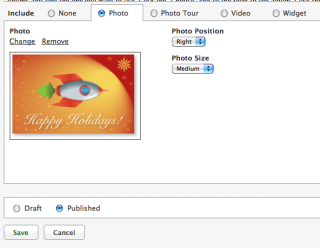 Use the drop down boxes to select the Photo Position and Photo Size for the photo to appear on the page. Click the “Save” button to finish. You can also choose the “Photo Tour” tab beneath the text box. Click the “Change” link. Look through the list of photo albums and find the one you want to use. Click the “Choose” link to the right of the album. Click the “Save” button to finish.